Tall booklet style wedding program. 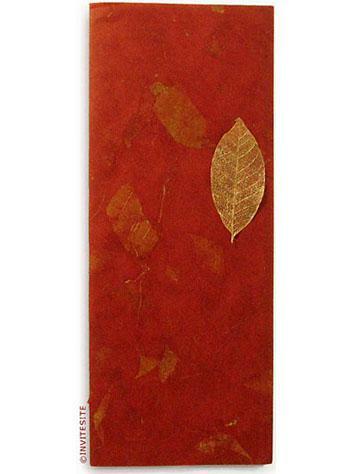 Cover made from brick red mulberry and mango leaves tree free paper. Print your ceremony information on 100% post consumer recycled husk cardstock (standard 8.5x11 inches). Inside Sheet Can Be Printed On Both Sides. You attach the printed sheet to the cover paper at the spine, with gluestick. Decorated with a real (skeleton) rubber leaf, sprayed gold.